Google’s Street View Trekker has landed in Melbourne to help Tourism Victoria and IE Agency map popular tourist destinations. Google have partnered with Tourism Victoria’s long-time digital partner IE Agency to collect Street View imagery at iconic tourist destinations across the state. Two of IE’s team members will be on the ground with the Street View Trekker, using it to take panoramic photos as they walk through Melbourne’s best and greatest cultural, social and aesthetic locations. 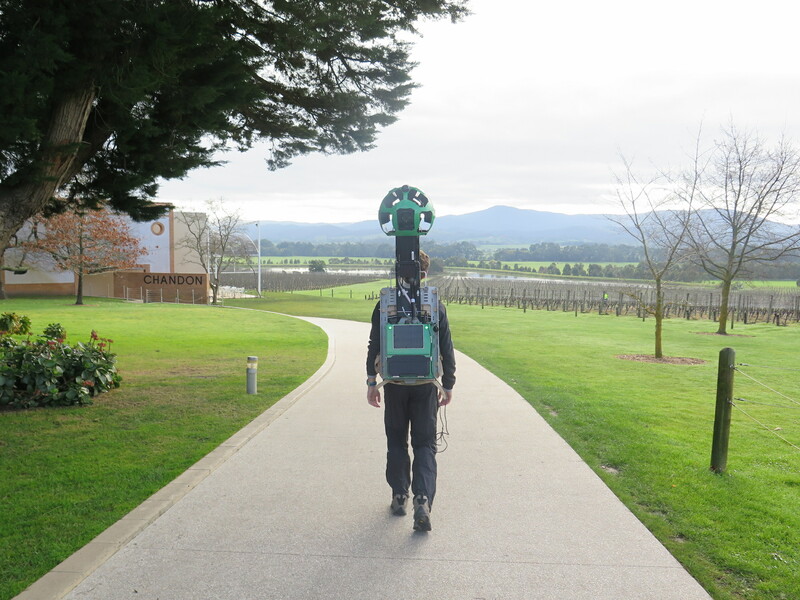 The Street View Trekker is Google’s newest Street View camera platform, a wearable backpack with a camera system on top. There are 15 lenses at the top of the mast, each pointed in a different direction to create a 360-degree panoramic view. IE’s operators will map famous Victorian destinations such as: The Great Ocean Road, Hanging Rock and The Royal Botanical Gardens. The imagery will be stitched into panoramic digital renderings of these walks and then published on Google Maps – allowing tourists around the world to take a virtual trip to Victoria online and better plan their trip. Street View Trekker is designed to capture imagery in remote places or places only accessible by foot, giving users the option to view ski-slopes, rocky-mountains and parks. By collecting the images with the Street View Trekker, Google plans to create beautiful panoramic tours that users can easily navigate through in the same way you’d navigate down a normal road on Google Maps. Street View Trekker has already captured the renowned locations of The Grand Canyon, Venice, Mt Fuji, Galapagos Islands and the temples of Angkor. Australia is soon to be amongst these landmarks, with the help of Tourism Victoria and IE Agency. The Victorian Minister said of the opportunity, “The Victorian Government, is pleased to use the Street View Trekker technology to capture 360 degree panoramas of some of Melbourne’s most visited attractions, including Federation Square, the Melbourne Cricket Ground, the Great Ocean Road and the Yarra Valley,” Ms Asher said. Ms Asher said harnessing cutting-edge technologies, such as Street View Trekker will continue to be used promote Melbourne and regional Victoria. “This latest project through Tourism Victoria, follows the success of stage two of the innovative Play Melbourne campaign, which featured ‘Remote Control Tourists’ equipped with wearable cameras and microphones who were directed to explore the city by prospective visitors via a purpose-built website,” Ms Asher said.